Yes, I’m pretty darn excited to see this concert. 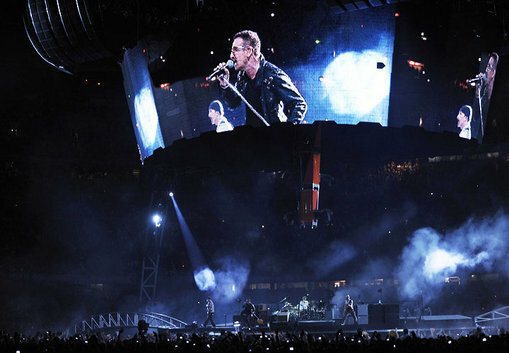 BARCELONA, June 30 (Reuters) – U2 kicked off their first tour in three years on Tuesday, rocking a raucous Barcelona crowd of around 90,000 and reaching for the stars with a live link-up to the International Space Station. 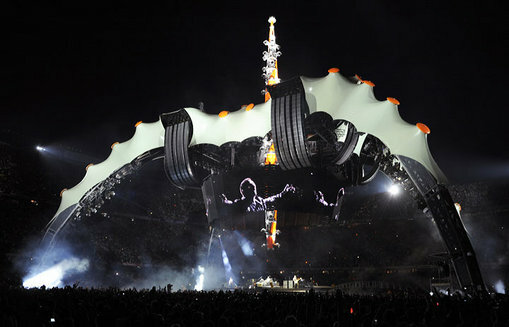 Featuring one of the biggest concert stages ever built, the U2 360 Tour will visit 31 cities across Europe and North America and entertain an estimated three million people. More dates are expected to be announced in 2010. Fans surrounded the circular platform inside Barcelona’s Nou Camp stadium, allowing for a bigger audience and lower average ticket prices during the global recession. They also dedicated a song to Michael Jackson, and if you are a fan of U2, I’m sure you can guess the song. U2 mixed old songs and new, playing classics including “Beautiful Day” and “Sunday Bloody Sunday” as well as “Angel of Harlem”, which the band dedicated to U.S. pop star Michael Jackson, who died suddenly last week aged 50. “We wrote this one for Billie Holiday but we are going to play it tonight for Michael Jackson,” said Bono. “Unspeakable talent, that’s all there is to say, really,” he added, and the song morphed into Jackson hits “Man in the Mirror” and “Don’t Stop ‘Til You Get Enough”. I’m awfully interested in how the band sounded singing those two Michael Jackson songs. My guess was no matter the intent, the songs were probably butchered. I just don’t think Bono has the voice to carry those songs. The tour is reported to be the group’s most expensive to date, costing an estimated $100 million, but industry experts suggest it could be money well spent. and big, very, very big. The stage, which takes 120 trucks to transport, is another grand statement from U2, which has won more Grammy awards than any other band. Heck, I would be interested just seeing the convoy. Here are more photos from the concert. I noticed that Edge is not wearing a numbered shirt. This entry was posted in Pop Culture, U2. Bookmark the permalink.